At Galts Goldsmith, our 30 years of design and manufacturing experience makes creating your own piece a reality. Or, you can choose from one of the carefully handcrafted masterpieces on display in our showroom. Our access to suppliers from around the world ensures that you have an exceptional choice of precious metals and exquisite gemstones. 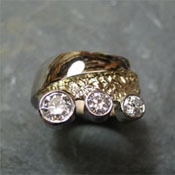 Galts Goldsmith creates works of art using stone, steel, bronze, oils, watercolours, wood and ivory. Our pieces can be found in the collections of Private Connoisseurs and Public Corporations alike. Visit our showroom for a display of paintings and object d'art. 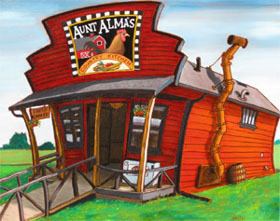 Galts Goldsmith is currently a member in "Alberta Society of Artists" and "Interpretations Artists Association". 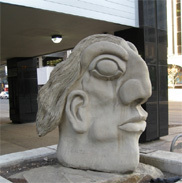 Our Momumental Sculptures can be viewed in Calgary at Mount Royal College, Downtown's Barclay Mall, Nat Christie Park, Signal Hill Park and Bow Valley Christian Church. Gallery size sculptures are available through the showroom or by commissioning a special piece. Galts Goldsmith is the co-founder of the "Stone Sculptors Guild of North America". Galts Goldsmith is one of a handful of artisans in North America today that strive to preserve hand engraving by teaching this craft in-house and in Colleges around Alberta. 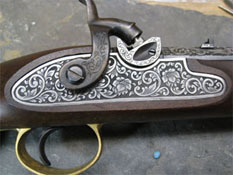 Recognized as one of Canada's foremost Hand Engravers, Galts Goldsmith was commissioned to etch Hockey's International Liver Cup, the Nation's Cup for Show Jumping as well as the rifle used in the television series "Lonesome Dove" along with various handguns and a sword handle for the movie "Shanghai Noon". We currently accept commissions from Gunsmiths and Custom Knife Makers throughout North America.